Industrial development is always projecting high on the graph. The average growth rate is dotted vertically high growing at the rate of 7 percent every year. Sevice industries are mainly projected to account the most job growth. 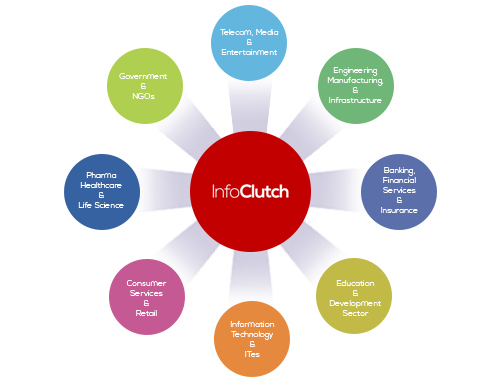 InfoClutch in industry wise email list has almost all major industries database like Healthcare and social assistance, Banking and Financial Services, Aerospace/ Aviation Industry, construction, educational govt and private, Manufacturing, chemical industries and many more. We know that ‘One Size Doesn’t Fit All’. Hence, at InfoClutch we customize our data based on your specific preferences so that you can know your customers better and eventually serve them better. To make your job hassle-free, we classify businesses by geographic regions, demographics, size of the prospective market, roles played by the intended recipients and other selects. By reviewing your campaign and intended recipients, we create industry wise email list that suits your requirements. Furthermore, we allow you to reach key executives within individual organizations so that you interact with the ones who make decisions. Our Strong data partner network has extended its reach to serve markets across various parts of USA, UK, Australia, Europe, Australia, Africa, South America, North America, Asia and more. Also, our key data scientists, experts, and analysts put immense efforts in collating data from trusted sources to keep it redundant free and up-to-date. Our authentic and comprehensive industry wise mailing list has the relevant information to connect with your target audience via email, telephone, and direct mail. If your business operates in a specific industry and you are on a constant search for industry specific data to support your marketing and sales operations, your search ends here. InfoClutch is well equipped to help you with all the relevant data to facilitate the progress of your multichannel marketing campaigns and to approach your target prospects. Our marketing data spans across various industries, be it Information Technology, Healthcare, Banking and Finance or any other.